Get those Videos out of the Basement! Worried about those old home videos that are losing quality or breaking? Tired of connecting your video camera to the TV each time to watch your tapes? Don’t waste any more time, convert them to DVD to preserve your precious memories! 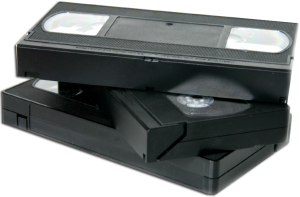 We convert VHS, Mini-VHS, High-8 and Mini-DV tapes to DVD. Simply send us your tapes and we’ll return them back to you with a new copy of the video on DVD. DVDs are a digital quality format that are more durable and they can be re-copied, literally forever, without the loss of quality. Plus they are much more convenient to watch on your home TV! Each conversion includes a one-for-one conversion from your old home video to DVD (what you see on the tape is what you get on the DVD). Chapter breaks are included every 5 minutes which will allow you to skip through your video easily. DVD labels and cases are also included!